All of us, at some point in our lives, have been lied to. This is a given fact. As a wife, I’ve told my fair share of tall-tales; “No, Hector, those shoes aren’t new. I’ve had them for years!” Moms lie as well, “Sorry, but the restaurant with the games and the oversized rodent has closed down for good, kids.” We, sometimes, have to lie to save our skin. While it’s inevitable, it doesn’t make it hurt less when we find out that we’ve been lied to. I discovered as much while at a writer’s retreat recently. You may know that I write content for Simply Recipes; well, at our writer’s retreat we were introduced to Chef Kevin O’ Connor and Cobram Estate olive oils. So, friend, for every time I’ve told you not to fry in olive oil- I apologize. It wasn’t my fault, nor was it my intention. I intend to make it right, right here and now. Please forgive me. What Makes Olive Oil Great for Frying? Cobram Estate olive oil hosted a session where we were able to taste, and get an education in, all things olive oil. Think wine tasting, except with oil. It was divine. We sat around our teaching space and forcefully sipped oils through the sides of our teeth. 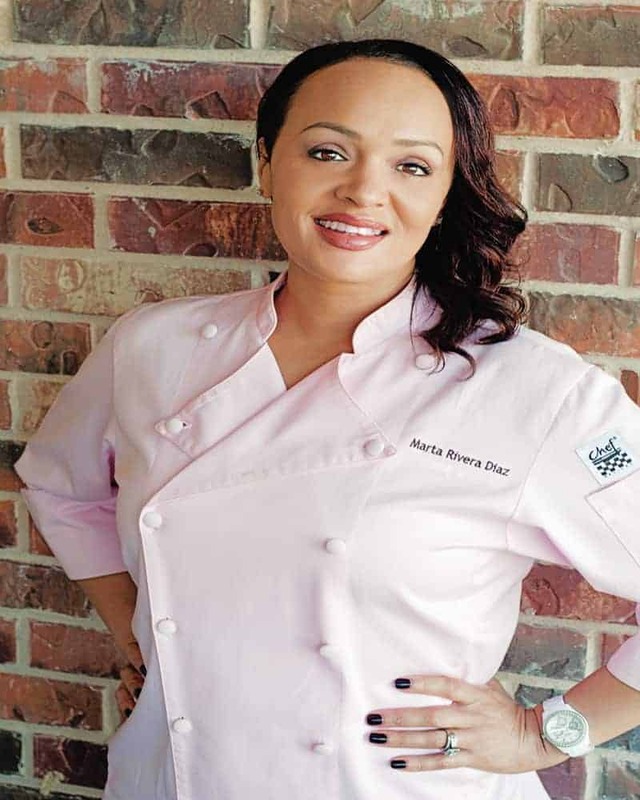 It allowed us to taste the nuances and undertones of a particular oil, so much so, we oohed and aahed because we were able to taste the flavors of oils in new ways. The fact that olive oil is healthy to cook and bake with was reiterated, but when Kevin dropped the bombshell that frying was okay, I looked at him all kinds of sideways. Polyphenols are what gives olive oil its positive health qualities. What stood out to me was how great of an anti-inflammatory olive oils are. I have an issue with my body hating me more days than not, so that excited me. Polyphenols are also great for anti-aging (hello 40!) and- as most of us already know- a healthy heart. BUT FRYING, Kevin!?!? Chefs all through culinary school history have told us using olive oil to fry in is a no-no. But guess what? They’re wrong. Because I was always told it was bad, I believed them, and never tried to find out on my own. I’m not a rebel in any sense of the word. But, when Kevin told me it was a thing, I decided that I needed to try it out. After trying Cobram’s California Select blend, Kevin and I locked eyes and I said, “Plantains!” He gave me a knowing nod and said, “Tostones.” Yes. Tostones! Plantains, or platanos in Spanish, are simply cooking bananas. They are not the same as eating bananas- in size nor taste. Plantains are larger and starchier than regular bananas. Although they can ripen and grow sweeter, they will still possess a starchy taste and can’t replace the banana in your smoothie in the least. The perfect plantain for tostones (twice-fried plantains) is one that is bright green. They should feel hard and the peel should have very little- to no- yellow. The only plantains I was able to find had more yellow than I care for, but you’ll see how green they still are. You’ll need Cobram’s California Select (find it here) which is the only olive oil that I’ve ever tasted that has plantain notes in its finish. The dip is a blend of mayonnaise, ketchup, and a pinch of garlic powder. I have no idea if I even spelled “mayo-kechu” correctly. Bastardizing a language is harder than you can imagine. I wrote it phonetically anyway. Before companies in the States tried to hijack our concoction, we were eating the mayonnaise and ketchup concoction. I’m talking decades before, my friend. I remember eating mayo-kechu with tostones as young as my memory exists. You don’t have to, nor should you pay for this in a container. It’s insanely easy to make and requires little, to no, effort. Watch how easy: combine mayonnaise and ketchup together in a small mixing bowl using a whisk to blend them until smooth. Add a 1/4 teaspoon of garlic powder for even more flavor. Done! Put it in the fridge until we’re ready to dip our tostones in it. I refer to plantains (always) as platanos. That’s just what they’re called in our culture. To prep them for frying, we need to cut off the ends with a sharp paring knife. 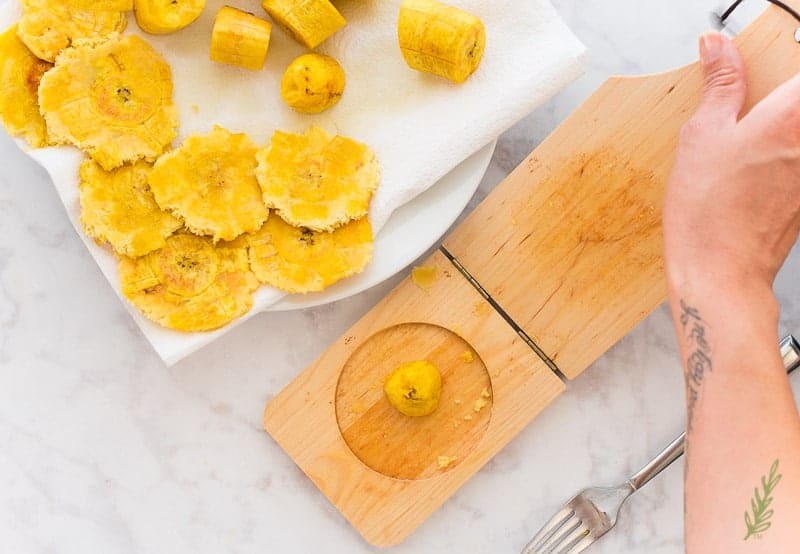 Once the ends are removed, cut a shallow slit down the backside of the plantain. You can cut it on the inner curve, but I found peeling them is easy when you start from the back. You’re not trying to cut into the flesh of the plantain, you’re cutting- at the most– an 1/8″ deep through (just the peel). 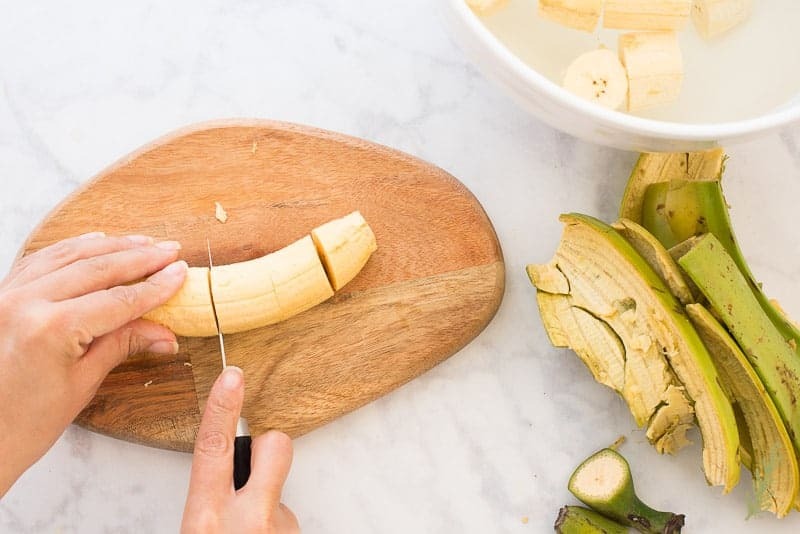 The plantain’s peel is firmly attached to the flesh of the banana, so wiggling the blade of your knife underneath it a bit (while you cut) is recommended. Doing this helps to loosen up the peel a little bit. 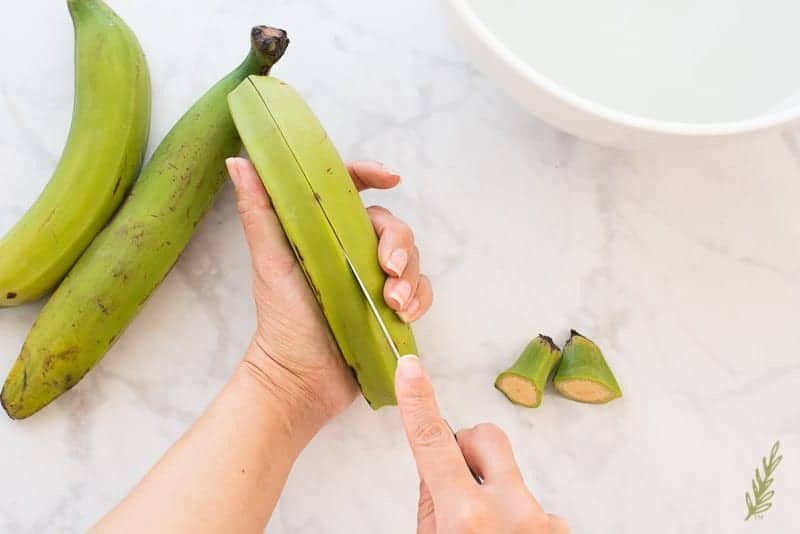 Use the tip of your thumb to get under the peel and press the peel up, and away, from the flesh of the banana using the meaty part of your thumb. Do this the full length of the peel (where you cut the slit). Once the peel is removed, you can discard them. Cut the plantain into 1 1/2″ thick slices. 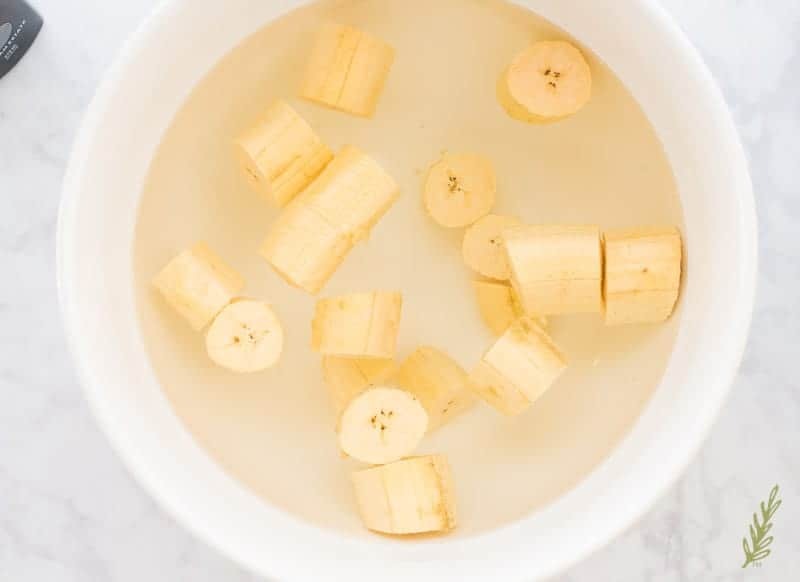 Put the plantain chunks into a larger bowl filled with cold water. Soaking the plantains, even for five minutes, will help remove a lot of the starch that comes out when you peel and cut them. 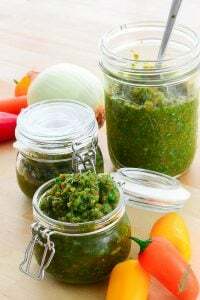 This prevents your oil from gunking up, and also makes for a crisper tostón. Heat your olive oil (I used an entire 12 ounce jar for this recipe) over medium-high heat in a Cast iron skillet or a cast aluminum dutch oven (also known as a caldero). Again, heat it as you would vegetable or canola oil with no fear. Trust me. 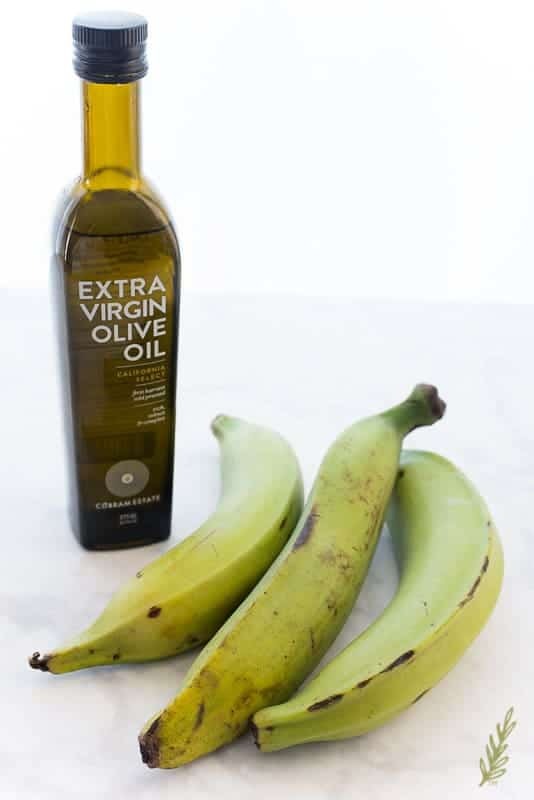 While your oil is heating, drain the water from your plantains and set the slices onto a paper towel or clean kitchen towel. Dry them thoroughly. Bad things happen when water and hot oil mix. 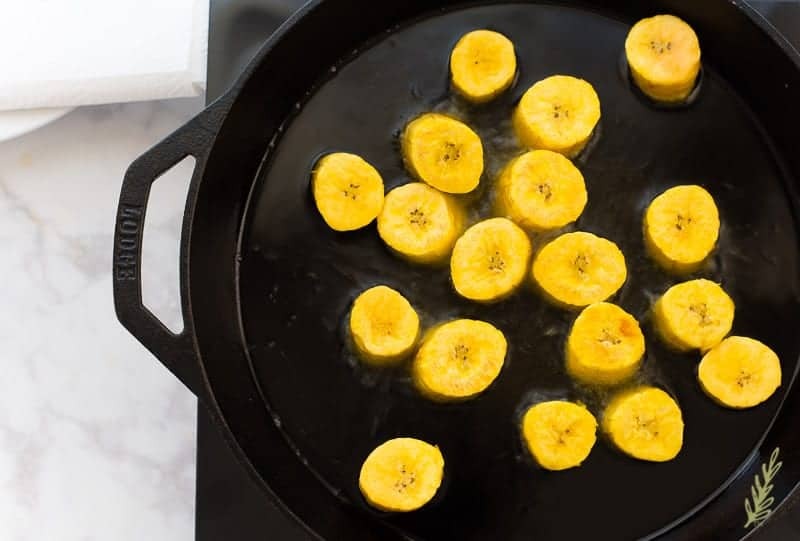 Once your oil has reached 350°F, place the plantain slices into the hot oil and fry for 3-4 minutes. Use a fork to flip the plantains over to the other side. Fry for an additional 3-4 minutes, or until a fork easily pierces the plantain and meets little to no resistance. Carefully transfer the cooked plantains to a paper-towel lined dish or pan and allow the fat to drain off of them. If you’re fairly proficient in the kitchen, i.e. you work fast, you can leave the heat on under the pan. If you’d rather work slowly, lower the heat so the oil doesn’t get too hot and burn the tostones. Just remember to crank the heat back up after you’ve finished with the next step. This, my friend, is something you will find in most Caribbean homes. It’s called a tostonera. I don’t think it has a name in English, and if it does, it’s probably something ridiculous like “Plantain-Smashythingie”. 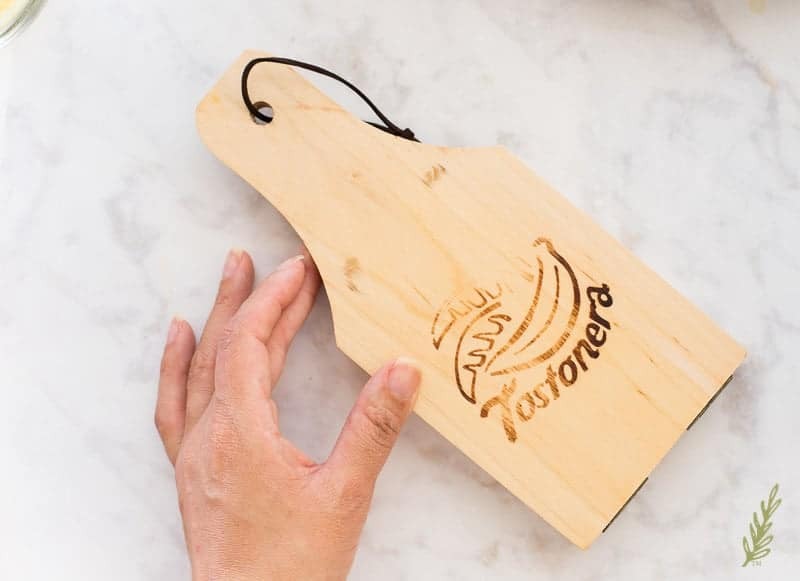 Tostoneras are used to smash chunks of plantains into thick plantain chips- or, tostones. It’s basically two pieces of pine that have are connected with a hinge. Think a door that smacks against a wall. The handy-dandy cord is used for hanging it in the kitchen. Ask any one of your Puerto Rican, or Dominican, friends if they (or their aunts or moms) have one and the majority will say, “Yes!” I don’t hang mine in my kitchen because it doesn’t go with my theme, but I do own one. To use it, open it up and put one of the plantain pieces into the center of the indented part of the tostonera. Close the tostonera. This is the tricky part (not really). Open the tostonera and remove the flattened plantain. You may have to lift the plantain up with your fork until the wood gets greased up. You know have a tostón!! Look at you, Rockstar! A perfectly fried plantain chunk should flatten with no effort other than what you used to close the tostonera. If you find that it’s hard to press down, it means the plantain is not cooked enough. Return them to the oil and fry for another minute, or two. I’ve got you covered even if you don’t own a tostonera. While, at $7 a pop, they’re cheap enough to have one, I get that you may not want to invest in it if you won’t use it often. If you don’t want to buy one, grab a sheet of wax paper, heavy duty plastic wrap, or a paper bag, which is the old-school way to do it, and which I highly recommend. 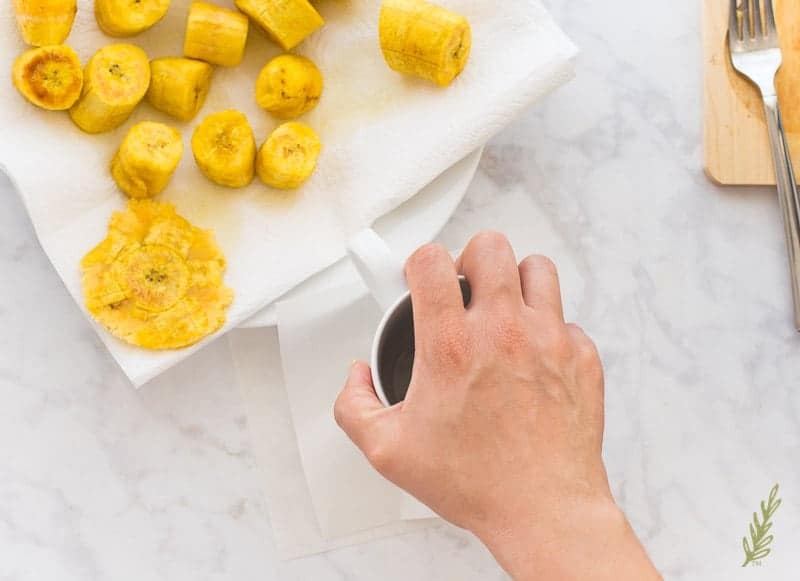 Fold the paper over the plantain, then press down on the plantain with the bottom of a coffee mug. BAM!!! 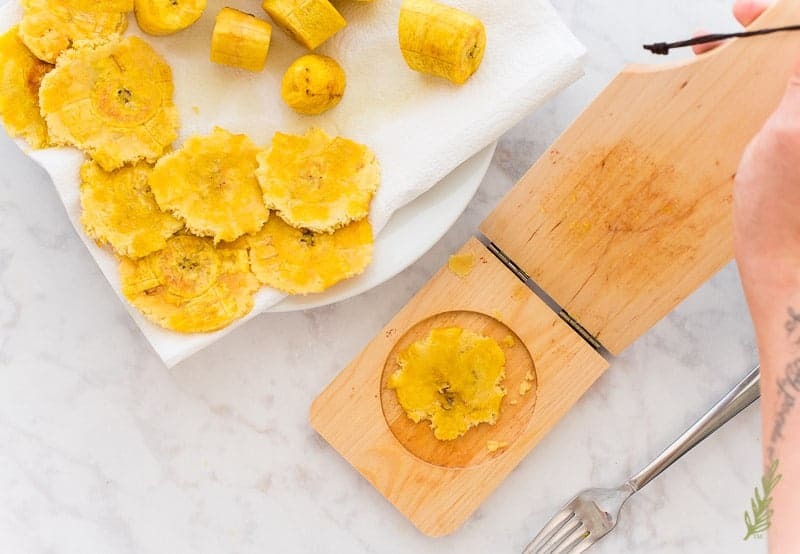 Tostones made with ingenuity! Place all of the plantains onto a separate dish. Replace the soiled paper-towels you first used to drain them. 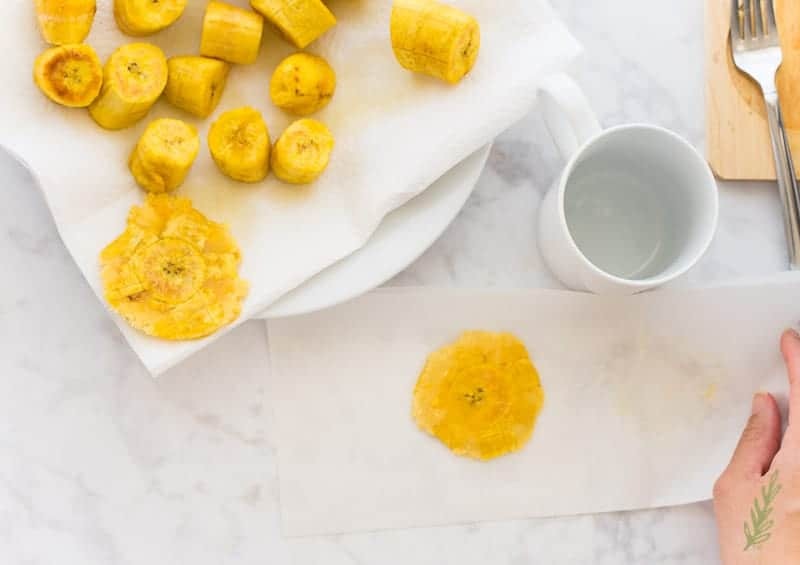 You’re going to need clean paper-towels because, now, we’re going to make the tostones. 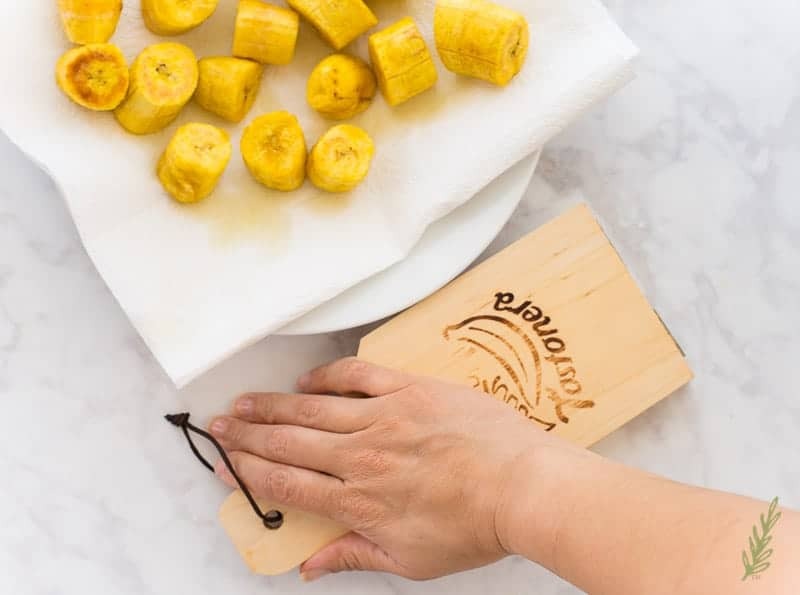 The flattening and re-frying of the plantains are what turn them from fried platanos into tostones. To complete the transformation, crank the heat of the oil back up to 350°F; then put the smashed plantains back into the oil to fry. 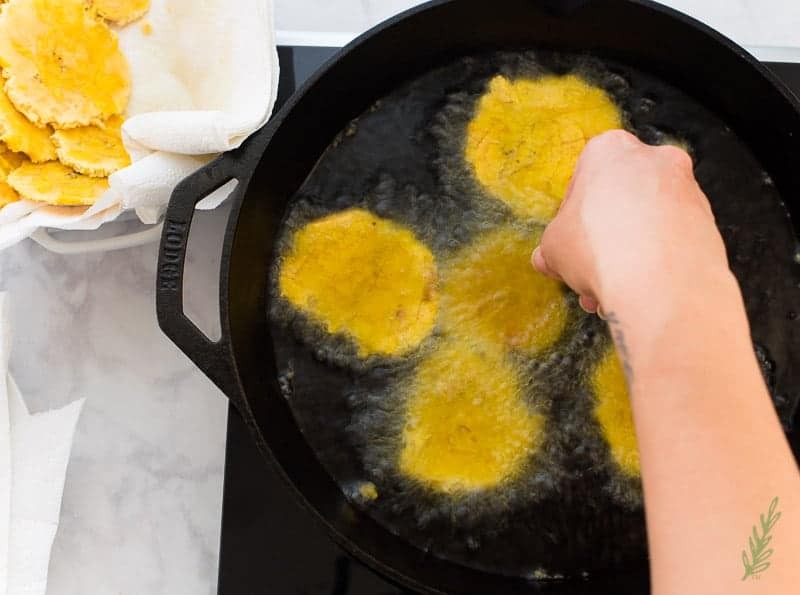 Don’t crowd the pan or you’ll drop the oil’s temperature and end up with soggy tostones. I fried 5 at a time. Fry the tostones for 2-3 minutes, per side, or until the edges brown slightly and they are crispy. Remove them from the oil and drain them on that prepared plate, once again. 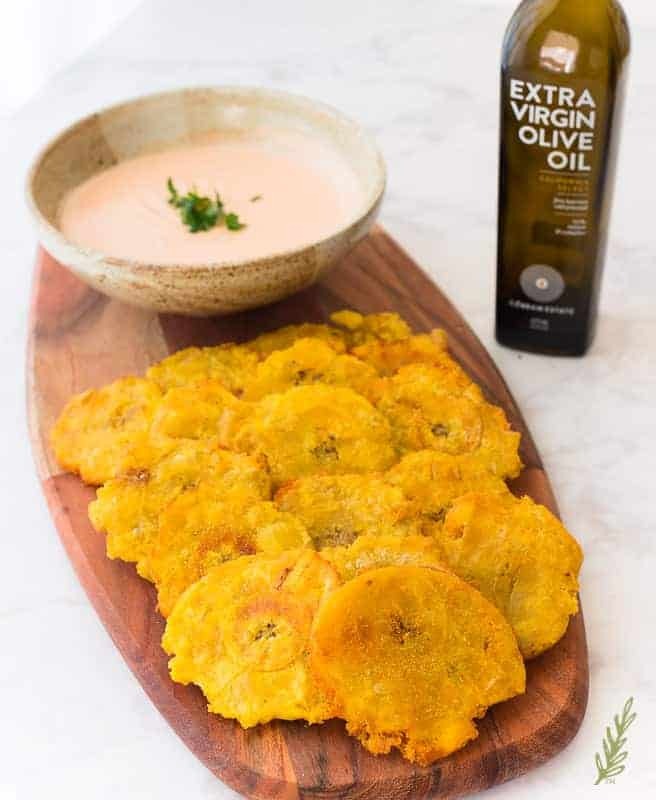 Sprinkle the tostones as soon as the come out of the oil with a pinch of salt, or Ádobo all-purpose seasoning. Continue frying until all the plantains have been cooked. 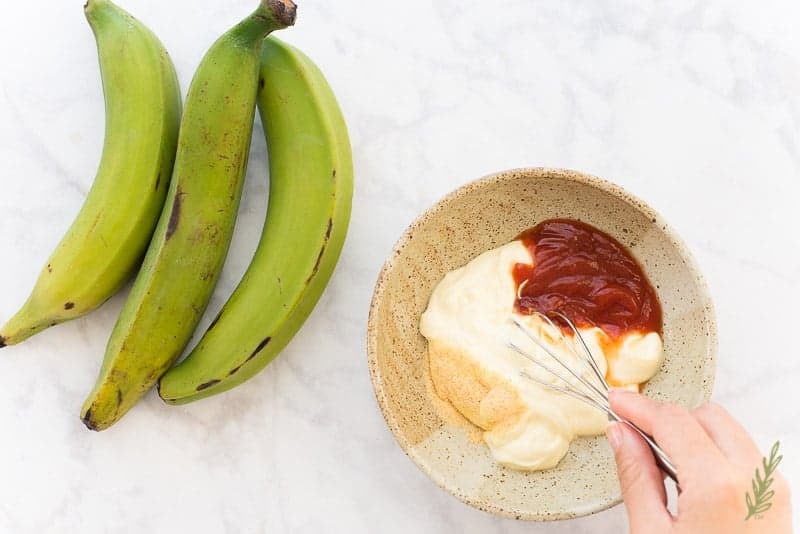 Once the tostones have finished cooking, grab the mayo-kechu from the fridge and serve it with the plantains. …serve it my favorite way, which is topped with a quick slaw. 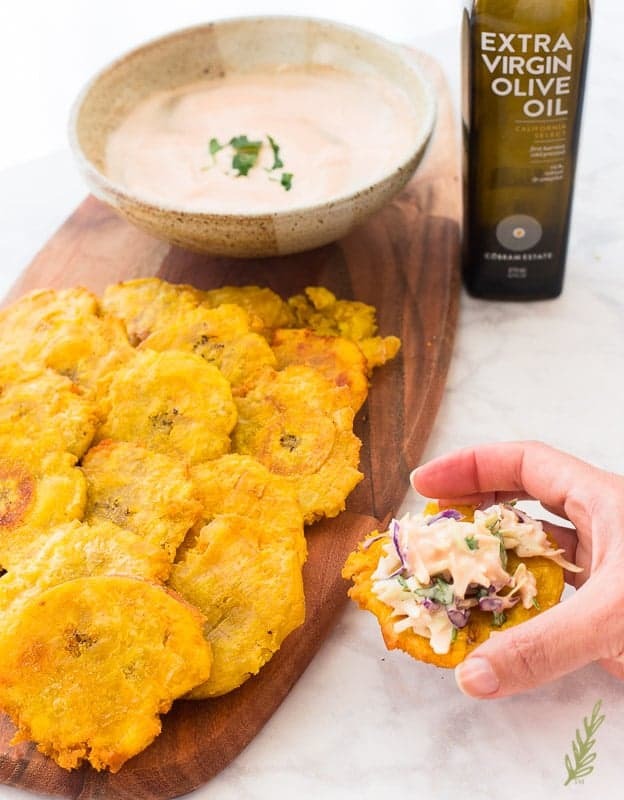 Tossing a cup of the mayo-kechu into 2 cups of shredded cabbage (coleslaw mix), 1 tablespoon of red wine vinegar, salt, and chopped cilantro is a fast way to bulk up the tostones. Toss these all together and you have a quick mayo-kechu slaw to spoon on top of your tostones. This makes a fantastic starter for parties or just for dinner. Like most fried foods, these tostones are best served hot. Reheat them in the air fryer, or in the oven, but they taste better when freshly made. The slaw (if you make it) is good for up to three days. Just keep it in the fridge. So, what do you say, Friend? Do you forgive me for perpetuating the myth that olive oil can’t be used for frying? I really do think this recipe will put us on good terms again. Let me know, ‘kay? Call me. Use this heart-healthy oil to create a great starter. Combine mayonnaise, ketchup, and garlic powder together in a small mixing bowl. Cut the ends of the plantains using a sharp knife. with a sharp paring knife. Cut a shallow slit down the length of the plantain on the backside. Try not to cut too deep. 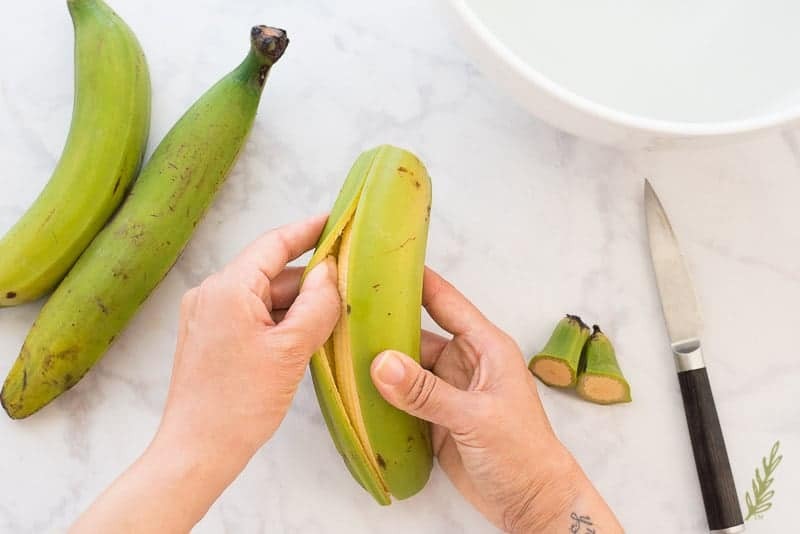 To peel the plantain: use the tip of your thumb to get under the peel and press the peel up, and away, from the flesh of the banana using the meaty part of your thumb. Remove and discard the peel. Cut the plantain into 1 1/2" thick slices, then soak the slices in cold water while you heat the frying oil. 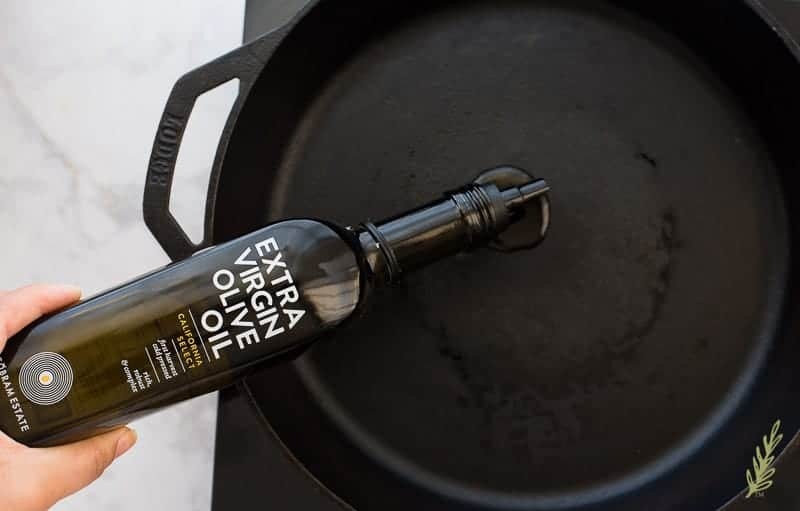 Heat the Cobram California Select Extra Virgin Olive Oil over medium-high heat to 350°F in a cast iron skillet. While your oil is heating, drain the water from your plantains and use paper towels to dry them thoroughly. 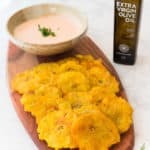 Once your oil has reached 350°F, place the plantain slices into the hot oil and fry for 3-4 minutes on each side, or until a fork easily pierces the plantain and meets little to no resistance. 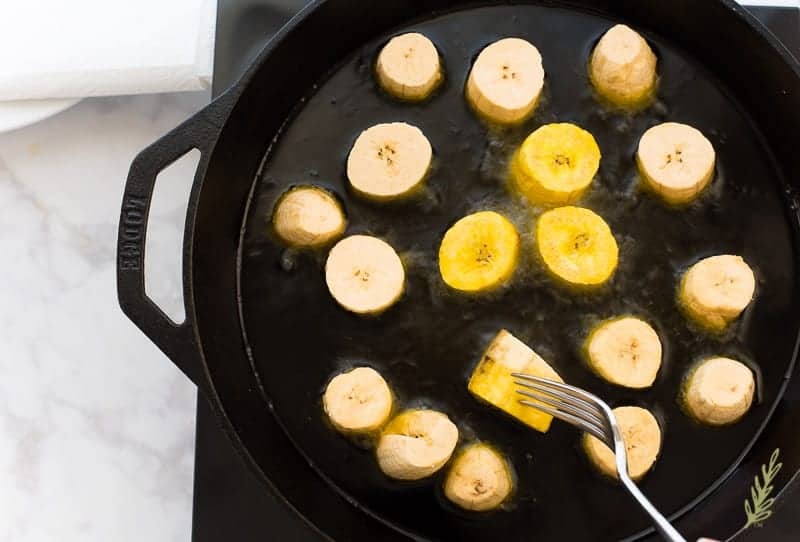 Once finished frying, carefully drain the oil from the plantains on a paper-towel lined dish. 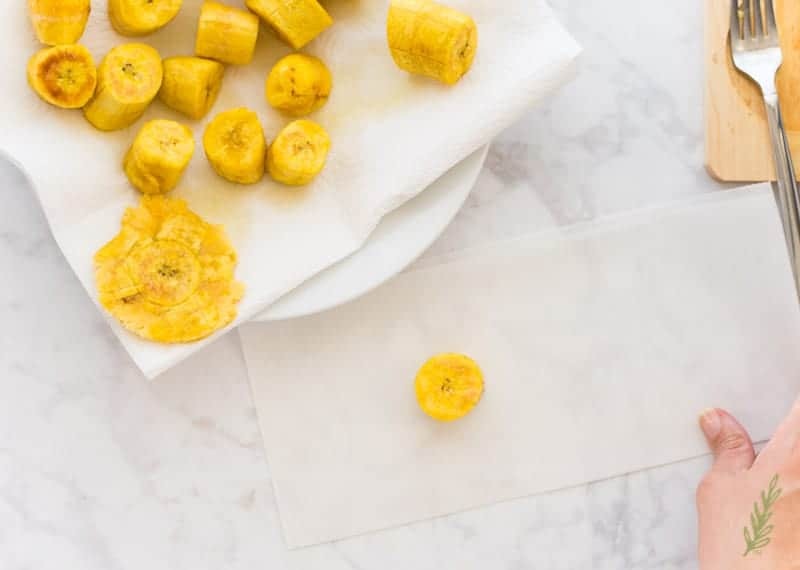 Flatten each plantain slice using a tostonera or by placing them in between a folded paper bag and flattening them with the bottom of a coffee mug. Place all of the plantains onto a separate dish. Replace the soiled paper-towels you used earlier with fresh towels. 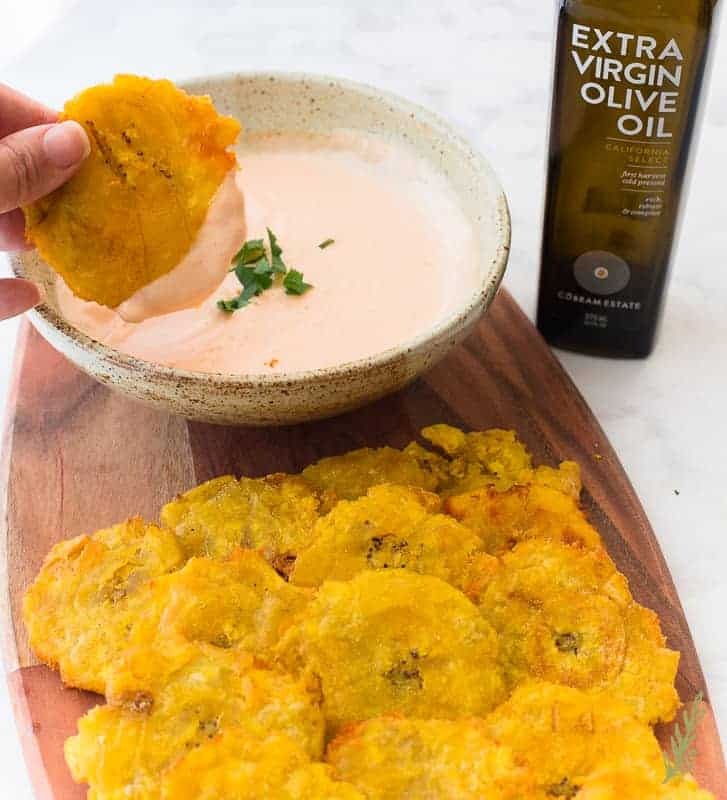 Increase the heat of the oil back up to 375°F; then put the smashed plantains back into the oil to fry for 2-3 minutes per side, or until the edges brown slightly and they are crispy. Remove them from the oil and drain them on your prepared plate. Sprinkle the tostones as soon as the come out of the oil with a pinch of salt, or Ádobo all-purpose seasoning. Continue frying until all the plantains have been cooked. Serve immediately with the mayo-ketchup, topped with the Mayo-Ketchup Slaw (recipe follows), or Garlic Sauce (recipe follows). 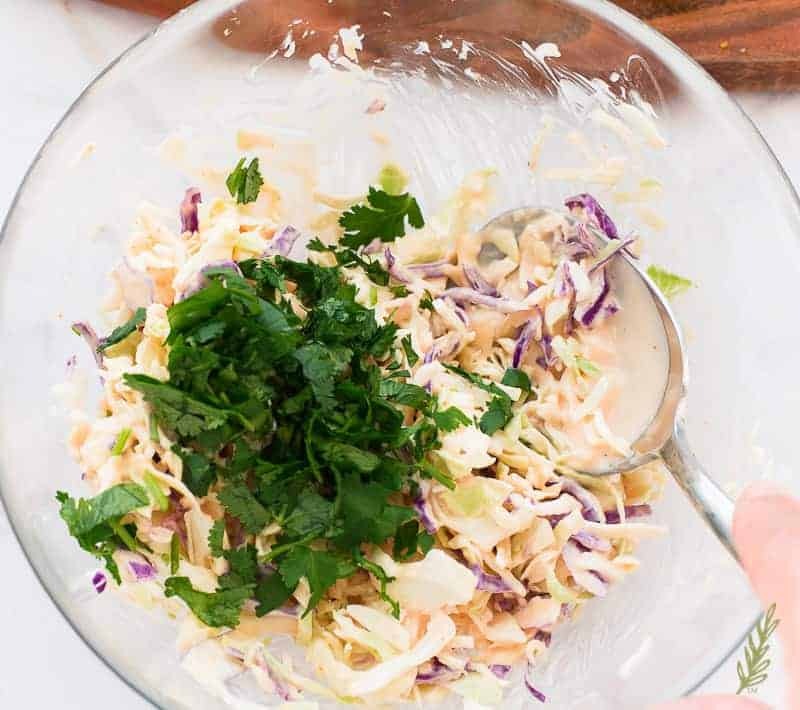 Toss the shredded cabbage,mayo-ketchup, red wine vinegar, chopped cilantro, and salt together in a mixing bowl. Spoon on to each tostón. Serve immediately. Stir together the mashed garlic and olive oil. Season, to taste, with a pinch of kosher salt. That Mayo-Ketchup and/or Garlic Dipping Sauce may be made up to 3 days in advance. They’re such a great snack, aren’t they? The garlic dipping sauce sounds amazing, perfect match! I love tostones but I have never tried making them. Looks totally doable though and so delicious for snacking!! I didn’t know I could fry foods in olive oil, either! 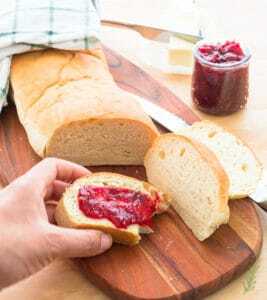 This looks super tasty and I’d love to make this for my family! I’m telling you, Marcie, it was a revelation for me! So Matt and I are drooling right now. Our friends from Puerto Rico used to make these all the time when we’d come over for meals (which was frequently). So delicious. Never knew the trick about the starch and soaking them in water. I think that I need to buy some plantains this weekend! Aww! Don’t you love that about the military. 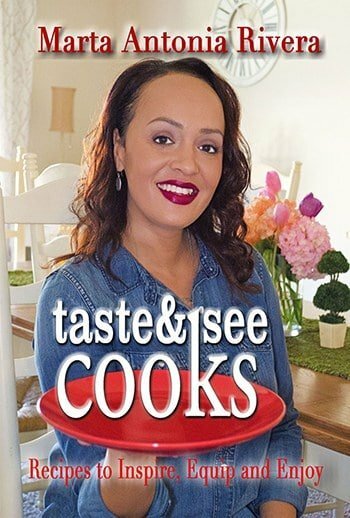 It exposes you to some amazing people and food. I love plantains!! These look divine!! SO fun! !